Sweden is a large country in northern Europe. It is one of the 5 countries of Scandinavia. Sweden shares borders with Norway and Finland. The country is also linked to Denmark by a road bridge. The capital city of Sweden is Stockholm. Other big cities are Malmo and Goteborg. Sweden has been part of the European Union since 1995. Sweden uses the Swedish krona as its currency. The Vikings, who conquered the British Isles, many parts of western Europe and even visited North America, were from the area which today includes Denmark, Norway and Sweden. The Black Death hit Sweden very hard and large numbers of people were killed in the 14th Century. The Black Death — This was the plague which killed huge numbers of people over many centuries in Europe, northern Africa and western Asia. During the 17th Century Sweden ruled over the Swedish Empire which included present-day Finland, Estonia, Latvia and parts of Norway, Poland and Germany. After 1709 the empire shrank because of a failed attempt to invade Russia. In the 19th and early 20th century large numbers of Swedish people emigrated to the USA and Canada. The last war in which Sweden was directly involved was in 1814, when Sweden by military means forced Norway into a personal union with Sweden, a union which lasted until 1905. Sweden remained officially neutral during World War I and World War II. Sweden covers 449.964 km² (173.732 sq mi) of land. Sweden is the third largest country by area in Northern Europe and fourth in all of Europe. Sweden is surrounded by Norway, Finland, the Skagerrak, Kattegat and Öresund straits, and the Baltic Sea. The highest mountain in Sweden is Kebnekaise at 2,111 metres. Sweden has a temperate climate despite its northern latitude with distinct seasons and mild temperatures both in winter and summer. Sweden is much warmer than other places in the same latitude, mainly because of the Gulf Stream. In southern and central Sweden, summers are pleasantly warm (sometimes hot or cooler for a couple of days) with comfortable cool evenings; while the north experiences cooler temperatures. In the summer the sun hardly sets in Sweden, especially in the far north where it does not set at all. This allows activity until late in the evening, or even through the night. During winter, temperatures are close to freezing in the south, slightly below freezing in the central regions, and very cold, snowy and below freezing for around 6 months in the north. Yearly average precipitation (rainfall) in most of the country is between 500 and 800 millimeters per year. In some parts though the average is between 1000 and 1700 millimeters. Thunderstorms account for most of the precipitation in the summer. Snowfall usually occurs between November and April, but in northern regions, snow could fall from September to May and stay on the ground for almost 6 months. Photo by Tom Corser www.tomcorser.com. Just under 10 million people live in Sweden. The dominant language is Swedish, though it is not an official language. Other languages spoken include Finnish, Meänkieli, Sami, Romani, and Jiddisch. 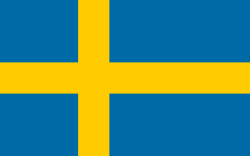 Sweden's population is mostly made up of Scandinavians and Germans. Today most Swedish people are Atheist but traditionally most of the Swedish population have Christian Lutheranism as their religion. Around 5% of the population are Muslim, mostly because of recent emigration from south-eastern Europe and the Middle East. All young children from 1-5 years old are guaranteed a place in a public day-care facility. Between ages 6-16, children attend required comprehensive school, divided in three stages. After completing the ninth grade, 90% of students continue with a three-year upper secondary school. Sweden is the third largest exporter of music in the world after the UK and the USA. ABBA, The Hives, Ace of Base, The Cardigans, Caesars and Roxette are notable groups from Sweden which are popular all around the world. Sweden is a constitutional monarchy, with King Carl XVI Gustaf as its current head of state. Sweden is mostly visited by tourists from its neighboring countries Denmark, Norway and Finland. Tourists also come from Germany and the United Kingdom. Sweden has a large number of lakes and forests, and it is very good for fishing and canoeing. There are several large lakes. Walking is quite a popular activity in the summer. There are no very high mountains in Sweden, so climbing is somewhat limited. Sweden is the 21st most visited country in the world with over 7 million foreign visitors every year. Stockholm is popular with tourists of all types and people often go further north to experience the wild and under-populated parts of Sweden. There are 14 UNESCO World Heritage Sites in Sweden including Laponian area (Swedish Lapland) and the ancient town of Visby on the island of Gotland.